Well to me this is just a 25.5" Jagmaster with Jazzmaster Pickups. So just Fender copying itself with a "new" Pickup configuration. Cool for some. Especially for those who are either used to the Strat Trem or afraid of the traditional offset. The Doheny is surely a nice instrument too. But as I love the smoothness of the offset-vibrato and the behind the bridge noises I wouldn't want to live without it! If you don't like it, don't buy it. Simple as that! And as stated above: it's nice that they do offer some variants of that 60 year old model! So it's ok for G&L to copy the jazzmaster and put their trem on it... But if Fender does it with a strat trem then they are copying G&L (WHICH COPIED FENDER IN THE FIRST PLACE) and on top of that, it's not a jazzmaster? Well, who did the Jazzmasters with a Strat tremolo first, G&L or Fender? For the record I also thought the Doheny was lame, I love G&L but thought they could have done a lot better had they put anything except the most cursory of thought into the Doheny. G&L's Facebook shows development pics of a Doheny with MFD humbuckers under a Jazzmaster cover- that will be cool and give the guitar more identity. G&L also offers the Doheny with a saddle lock/hardtail which is the way I'd go, as good as the DFV bridge is. I really prefer G&L's old Leo Era shapes, before they transitioned to Strat bodies on the S500 etc. - So actually I'm glad they're reviving it with the reissued Skyhawk, Superhawk/Rampage etc. Even the original SC shape is quite different from a Mustang. In a way I just look at the Doheny more like a slightly alt. version of the SC2 and it sits fine with me that way- but it's their least unique shape. Even the neck pocket is Fender style. I bet it's a fine guitar. But it does seem entirely driven by corporate bs. To me, the Doheny seems like an honest attempt to make a G&L JM. Sure it would have been great to see what kind of new offset trem they might engineer, but it's not my company, you know? This thing seems like a cheap shot to make sure that nobody is buying a G&L that would happen to think a "real" Fender is better. I don't care about it enough to actually weigh all the ethical considerations of brand protection and stuff—but it definitely seems like that entire debate lives in corporate land. But whatever, it's not my multinational corporation either, you know? Anyway, could be worse: it could be an Evertune bridge*. I'm in btw, if anyone wants to make an official OSG pool for when the first Fender offset with an Evertune bridge comes out. *I've never played one, but as far as I can tell this is kind of an antithesis to offset bridges. It sounds awful. There's a spring to always balance the string tension—which can turn "off" bending if you choose. I rarely rarely bend (if ever), but still—I can't imagine how this doesn't just kill all character of the guitar. The Doheny has been popular, and Fender is probably reacting to that with this thing. That's what corporations do. I live in St. Louis, where Anheuser-Busch is from. When microbrews started taking away sales from the traditional beer makers like AB, they started coming up with versions of beers that were designed to look like microbrews (and taste like them)- think Shock Top and Blue Moon. By Ira Teinowitz. Published on March 06, 1995. Nearly a decade after Miller Brewing Co. unsuccessfully tried a wheat-based beer, Anheuser-Busch is giving it a shot with Crossroads. A-B said it will market Crossroads not as a specialty brew but as a mainline product complete with TV, radio and outdoor advertising from the Glennon Cos., St. Louis. Ads broke March 1, themed "There is a lot going on here." "We see it as a mainstream brand to address the changing demands of the marketplace," said Paul Stoddart, senior brand manager-specialty beers. A-B will test Crossroads with two price strategies. In Columbus, Ohio, and Minneapolis, it will be premium-priced, about the same as Budweiser. In Raleigh, N.C., and Denver, it will be a superpremium brew at the same price as Michelob. Mr. Stoddart suggested the market has changed since Miller marketed Dakota, but said Crossroads is closer to a German wheat-based beer than Dakota. Don't remember Crossroads? That's because it tanked hard and was gone from shelves in a month or so. So is the American Performer Jazzmaster a Crossroads, or a Blue Moon? How successful is the Doheny, anyway? And I just realized something... if there's a "Jazzmaster" in this series, there's probably a "Jaguar," too. I wonder what THAT will be? Probably a 1959 spec Jazzmaster. So it's a Fender G&L Doheny? 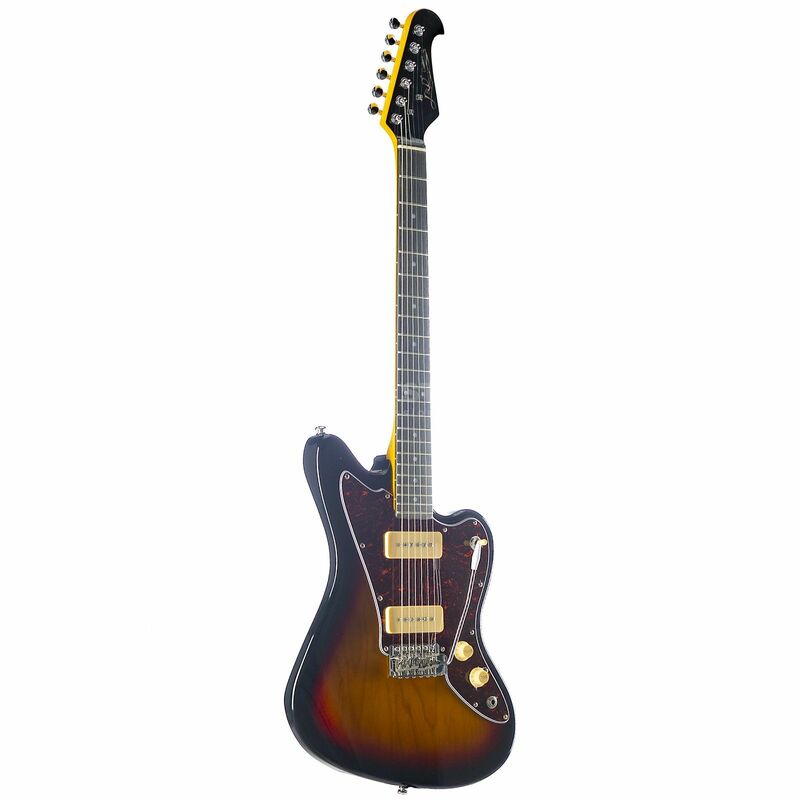 Fender's imitation of G&L's interpretation of Fender's Jazzmaster? This is like life imitating art imitating life. What's next? The Fender PRS Silver Sky - maybe call it the Avian-American Stratocaster? To be honest, I'd rather have this than the American Special Jazzmaster, which was just this guitar with a TOM instead of a strat bridge. At least this design uses a Fender bridge, rather than a Gibson one (which is also the worst design to have endured a half century+ for no apparent reason). Is the American Special still even made? Tune-O-Matics are probably my least favorite bridge. I might rather have a string-through hardtail Strat bridge on this than a Strat trem when it comes down to it though- hardtails have their place, as much as I enjoy trem use. Lame. They must have gotten salty over the Doheny. I prefer the Doheny for the DFV and MFDs. 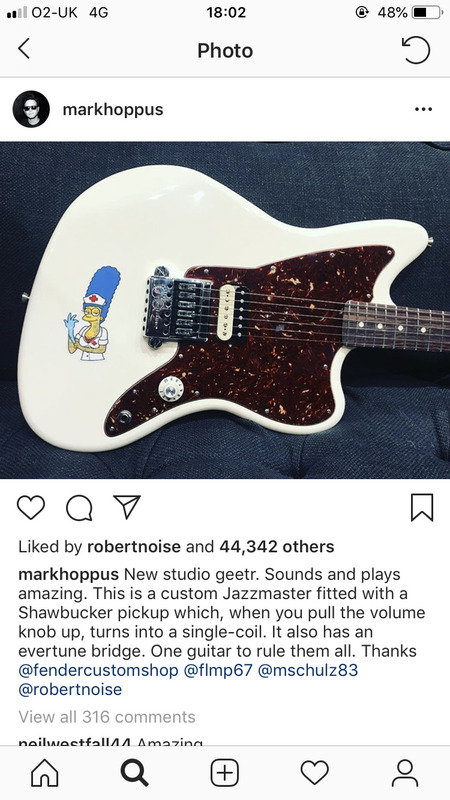 I’m not surprised to see Fender do this. At least this design uses a Fender bridge, rather than a Gibson one (which is also the worst design to have endured a half century+ for no apparent reason). I agree with that... even the worst Fender bridge is much better than the Tune-O-Matic. The G&L and the Fender are just knockoffs of the Jack and Danny Jungle Master. *This is a little out of date and unfair to Taco Bell, who have been working hard to successfully add to their core products, with such new items as the Shredded Chicken Mini Quesadillas™ and the new Beefy Nacho Griller™. 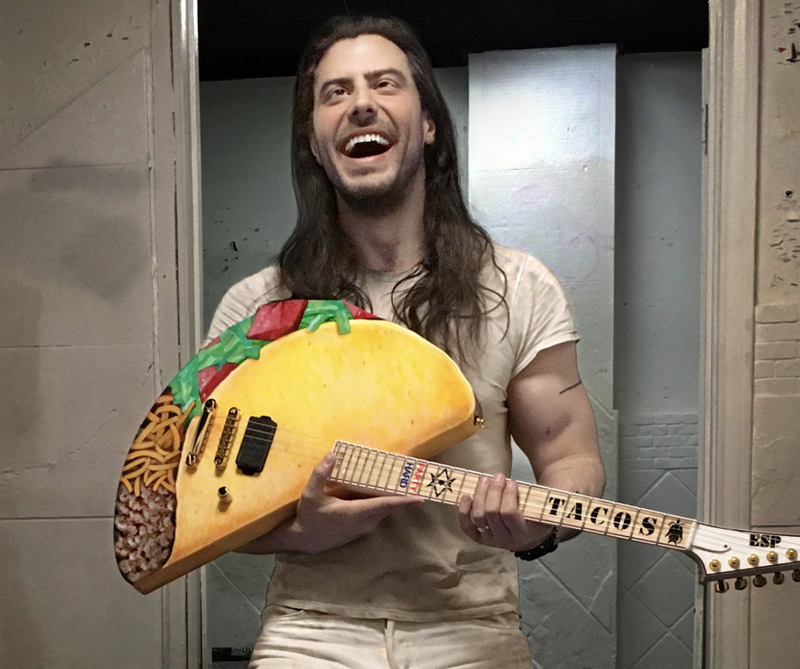 Fender wishes they had the kind of drive and innovation that you can find at a Taco Bell near you now serving 24 hours select locations. And it's offset on top of that... genius! Anyway, could be worse: it could be an Evertune bridge*.